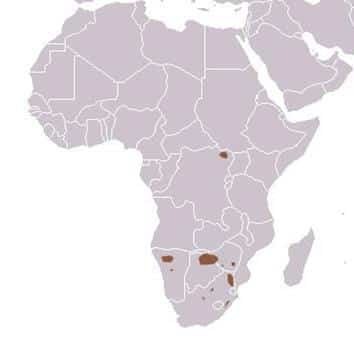 White Rhinoceros can be found in tropical and subtropical grasslands, savannas an shrub lands in Botswana (re-introduced), Kenya (introduced, Namibia (re-introduced), South Africa, Swaziland (re-introduced), Zambia (introduced), Zimbabwe (re-introduced). 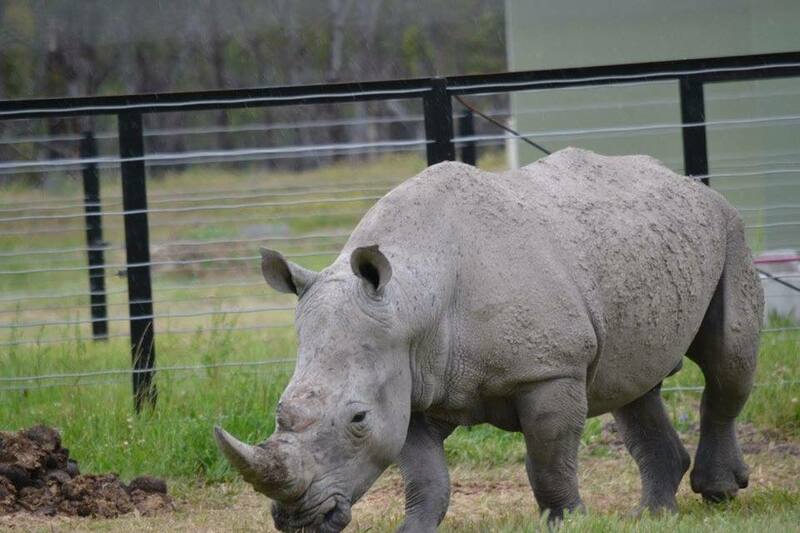 White Rhinos skin varies in shades of grey. Males can weigh from 1.8 - 2.5 Tonne with females being slightly lighter between 1.8 - 2 Tonne. They stand between 1.5 - 1.8m at the shoulder with a body length of 3.5 - 4m. They have a huge body, large head and broad chest. White Rhino have short, stocky legs with thee toes on each foot and a large hump on the back of the neck. They have two horns on the end of their nose with the front horn usually much larger than the inner horn and a square lip ideal for grazing. Rhinos have been around for over 50 million years. 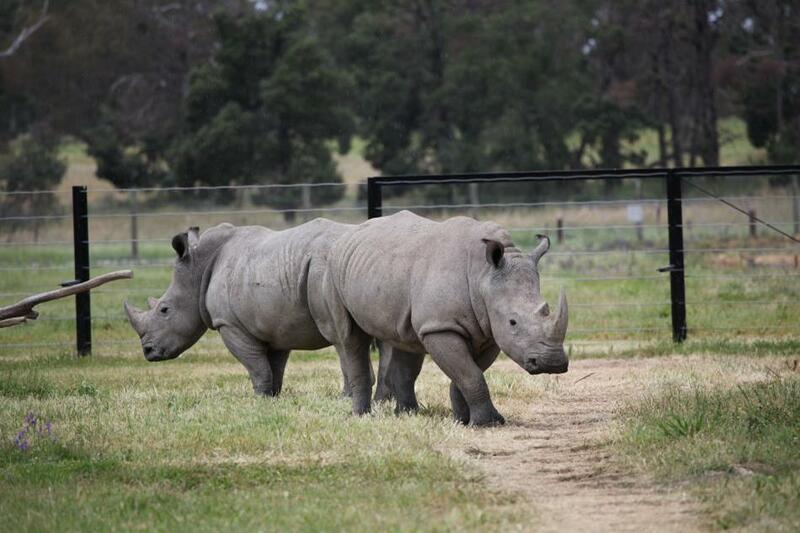 There is actually no difference in the skin colour between black and white Rhino, despite their names. The white component of the name may have resulted from a mistranslation of the Afrikaans word ‘weit’ meaning ‘wide’. 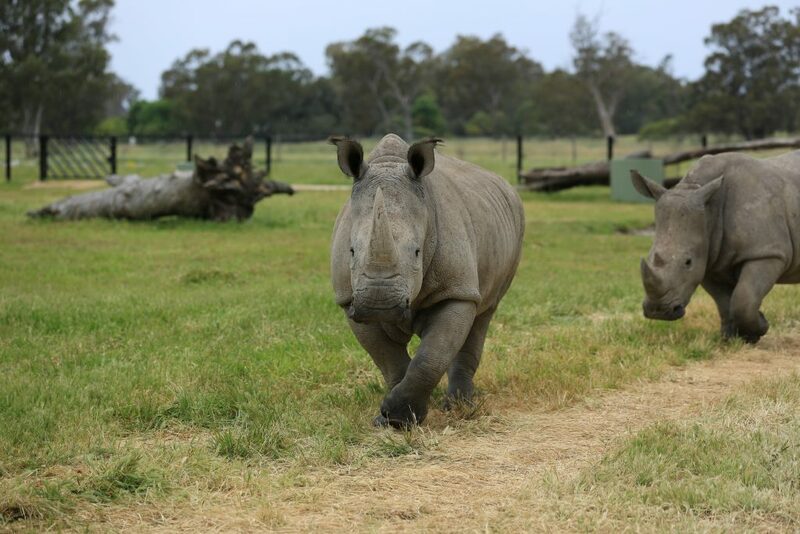 White Rhinos are surprisingly agile and can run up to speeds of 40km/h for short periods of time. They have pour eye sight but an acute sense of hearing and smell. The olfactory passages, that are responsible for the sense of smell, are larger than the Rhinos entire brain. Their skin is thick but sensitive to sunburn and insect bites, that’s why they like to wallow in mud. Rhino only have hair on their ears, tail tips and eyelashes. They communicate using a range of sounds from calf squeaking to snarling or wailing of adults. Diet: grasses and ground vegetation. They have adapted a square mouth with wide prehensile lips, enabling efficient grazing as a ‘mowing machine’. Reproduction: Females reach sexual maturity at 6-7 years of age, while males at 10- 12 years. Intervals between calving can range between 2 - 4 years with one calf being born. The calf will weigh between 40 - 65kgs and will stand within one hour. It will begin to graze at 2 months of age and stays with its mother for approximately 3 years. Gestation: Approximately 15 - 16 months. Poaching continues due to demand from Asian Markets for Rhino horn as a cure for a variety of ailments, as prices for Rhino horn increase, so do Rhino deaths.